WASHINGTON: The US State Department has refused to take a position on New Delhi’s complaint against Pakistan for using F-16s in an air combat with India, saying that it does not offer public comments on bilateral agreements. “We have seen those reports and we’re following that issue very closely. I can’t confirm anything, but as a matter of policy, we don’t publicly comment on the contents of bilateral agreements... involving US defence technologies,” the department’s deputy spokesman Robert Palladino said. At a news briefing on Tues­day, Mr Palladino said the US also avoided public discussions on communications with other countries about such issues. “So we’re taking a look and we’re going to continue to take a look, and I’m going to leave it at that,” he said. On Wednesday, New York Times journalist Maria Abi-Habib released a set of tweets saying that contrary to India’s insistence, Pakistan may not have violated its F-16 sales agreement with the US even if it used the American-made fighter jets to shoot down Indian aircraft last week. 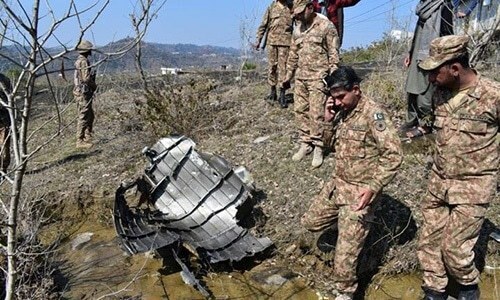 On Feb 27, Pakistan Air Force announced that it had shot down two Indian aircraft inside Pakistani airspace when they tried to give chase to Pakistani jets. 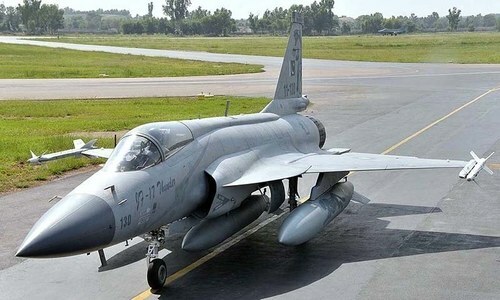 Indian officials, however, complained that the aircraft used by the PAF to ingress into occupied Kashmir had included an F-16. New Delhi insisted that Pakistan’s use of F-16 against India meant that Islamabad stood in violation of a sales agreement with the US, which reportedly restricts the fighter jets to be used for anti-terrorism activities alone. However, Abi-Habib, the NYT’s South Asia correspondent, explained how Pakistan may not have committed a violation of its sales agreement with the US even if it did use F-16s to shoot down Indian jets (which the PAF says never happened). “The US says if Pakistan used an F-16 to shoot down an Indian MiG, it may not have violated sale agreement,” she tweeted. Citing weapons experts and officials, Abi-Habib also put a question mark on the Indian Air Force’s claim that the AIM-120 missile’s remnant that was displayed by New Delhi was ‘proof’ of Pakistan’s use of an F-16 in the counter-strike to the Balakot incident. She also said US officials still do not have sufficient reason to bel­ieve that an F-16 was shot down by India, as claimed by the IAF. Abi-Habib noted that despite its desire to strengthen its ties with India, the US was not endorsing the Indian version of last week’s events. She described the US reluctance as “very interesting”. 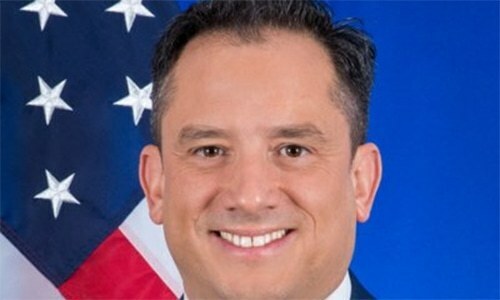 At the State Department briefing, Mr Palladino said the US was still engaged in “high level” but “quiet” diplomacy to reduce tensions between South Asia’s two nuclear-armed neighbours. “We continue to urge both sides to continue to take steps to de-escalate the situation, and that includes through direct communication. And we believe strongly that further military activity will exacerbate the situation,” he said. He noted that last week, Secretary of State Michael Pompeo played a direct and “essential role in de-escalating the tensions” when he spoke with leaders in both countries, including Indian Minis­ter of External Affairs Sushma Swaraj, National Security Advisor Ajit Doval and Pak­istani Foreign Minis­ter Shah Mehmood Qureshi. It's none of US's business what the F16 is used for. Do car companies sell cars with limitations on how their cars will be used? US refuses to take position on F-16 issue. ... Who cares if they do or they don't. Any decision will come to nothing anyway. A fake surgical strike which was basically more a case of running away at speed faster than they entered. Very satisfying last few weeks as a Pakistani. It's amazing how every single episode of this entire incident, every tiny chapter, has created yet more embarrassment for Hindustan. From the very first lie of linking the bomb blast to Pakistan, even their closest international friends have deserted them. And the funniest thing is, this whole saga was designed to isolate Pakistan! India is pathetic in everything it does. India is behaving like a school kid who snitches on others only worse because it's not even true. India had been concocting a false narrative to setup US against Pakistan but US is no fool. Giving no public comment is not same as refusing to take position. This matter is dead, because it's not important for the US. India lost this one, and should let it go. Pakistan won through better war tactics. This too shall pass, and then our dependency on the US equipment will be over. We shall still prevail. Indians are just crying like babies that their inefficient pilots were bettered by Pak Air Force Pilots. It’s not the aircraft or technology, but the heart and skill that matters and wins the game. Another big slap on the face of India!! India has a habit of lying, denying and accusing others for their own mistakes. @K. Aksay Gul, let's talk about it after the Taliban deal concluded by USA. What about Israel? They are using F 16s for years. Modi has been a huge embarrasement on the world stage with his lies and military defeat and those Indians who thing otherwise should wake up and smell the coffee. Taking a neutral stance in a war is like taking the wrong stance. @Askari, You missed to mention OIC resolution. The drop scene will be election results. Looking forward. India now shifted their humiliation to such non-sense as treaty seems to be to defend Pakistan airspace whoever be the party so using F-16 inside Pakistan air space against Inside is not violation. India tries to fool himself by raising such rubbish claims. @Faraz, it was in the contract. Indians scared of PAF pilots, not the plane. USA got paid forF-16s? End of matter. Message to India: ‘our chai is better than yours’. US is no mood to spoil relations with Pakistan due to ongoing talks with Taliban which are at a very crucial stage. Pakistan are no longer a hired gun of the US. Those days are gone. Pakistan will act in the national interest and put Pakistan first. So Pakistan acquired the F-16's only to ensure hefty profits for the manufacturers and display the same in our country to keep its people happy? Any aggression against a state by another would warrant use of any resources available at its disposal to thwart off any such attacks. Any agreements made otherwise are null and void under such circumstances without any considerations to the contrary. US is clearly saving India from big lies. This means the US has confirmed that Indians stories are fake.The US cannot embarrass India openly because of its policy of China containment. PAF bought F-16s in 1982. Used them against Soviet, Indian and Iranians on countless occassions. Nothing stops PAF from using F-16 or any aircraft against adversaries. You do not spend USD 3 billion on sitting ducks. What else can they say to stay afloat, show their importance, look busy, portray neutrality, avoid confrontation, strive hard to strike a balance between the two biggest nuclear-armed South Asian neighbors, get counted and remain in the media limelight? @Faraz, It was the condition of sale agreed by the government with the US government. Some commentators really ought to understand why something gets questioned and why a credible response is necessitated by the government. @Askari, Your comments are that of a person who hasn't really understood the facts in the matter. @Askari, India lost in 2014, by voting in a known terrorist as Prime Minister. Everyone knew of Gujarat Massacre. They made a choice. Lets see what they do this time. First of all, you dont need an F-16 to fight terrorism. Its a jet designed for high speed air combat. Unless terrorists have own fighter jets, the whole premise of such a clause, if it exists even, is absurd. Secondly what moral grounds does the US of A has to even ask other countries to not use their jets for agression , after having destroyed whole civilizations and countries to rubble with its aggressive wars. There is a clear video footage shared on social media, JF-17 chasing SU-30. Any aviation expert can confirm the jets and with the distance and angle the final outcome of that pursuit. It is the man behind the gun which matters. MM Alam of PAF shot down five 5 superior IAF jets with his F 86 aircraft . PAF pilots are the best pilots in the World . The F 86 aircraft were considered as obsolete aircraft by the US and removed from the US Airforce. Now Indian Prime Minister Modi says India would not have been shamed and embarrassed if they had Rafael Aircraft. India needs pilots like MM Alam or Hassan Siddiqi and a PM who tells the truth. It’s even embarrassing that Indian Air Force has the most ancient aircrafts in their Air Force and their armed forces don’t have food to eat, no basic infantry weapons, no sniper rifles, no modern helmets. The situation of their military is well known to world as New York reporter said. Modi and their media absolutely fooling the public. A shut up call and a tight slap to India by the US. Well done. Typical India always crying . India can only fight defenceless people. Hope people of Pakistan now understand what difference a real leader makes. Give imran Khan a long term chance and he will change Pakistan. Make it stronger and respected . geographical distances matter a lot, we being neighbors of India understand very well that they are suffering from bollywoodness but gradually the world is also becoming aware about this medical condition. Trevor Noah was right. As a citizen of the US I find this position repulsive. We should first determine how many innocents have been brutally killed by US weapons used by KSA in Yemen. People living in glass houses should not throw stones. Firstly there is no such agreement on their usage,but even if there was ,it would be a bilateral agreement between US and Pakistan.None of India's business,wonder why they are complaining? Indian pilots are not as good as Pakistan’s - period! Not bragging but alhamdulillah the skills that our pilots psssess are matched by few pilots in the world. PAF has won many international air shows. Also reported many times here. It is no good having the jets if you don’t know how to use them! I am just laughing at the naive Indian commenters who are saying that Us gifted F16 to Pakistan. Lol......I mean just listen to yourself. @Faraz, My dear Brother, the problem is that the corrupt politicians of PPP and PMLN have all taken bribes to accept such restrictions in the purchase of F16s. Anyway; I think if Pakistan is to advance its military hardware, it can go to many other countries other than USA. You can have F16 but use with our permission...It is as simple as this. In the last elections Indians made a worst choice, but this time hopefully sanity prevails in the elections. There is a huge difference in leadership in Pakistan and India. Imran Khan is Oxford graduate-Modi is local matriculation, Imran Khan loves peace-Modi likes war, Imran Khan has a broad vison-Modi sticks with narrow mindset, Imran Khan says India comes one step forward Pakistan steps twcie-Modi attacks Balakot did nothing-Imran Khan downed two aircraft and captured a plot. Imran Khan provided evidence-Modi yells in the name evidence. Huge and obvious differences. India deserves better leadership this time. F-16 were given free to pakistan to fight terror. Freebies comes with string attached. @Faraz, : US didnt sold these F-16 to Pakistan. Rather they gave it to Pakistan free of cost for counter terrorist operations. @Subir Paul, And that is what Pakistan has used it for / defending terrorist attack on Pakistan by A Terrorist State. @Faraz, these were sold with conditions of use attached. Get informed. It only reflect Modi’s desperation to show his people that world is on his side, and Pakistan has been isolated. Modi failed to present pictures of F-16 wreckage so far despite having very advance satellite technology. Next step for India to complain China for use of JF17 in combat fight. @Subir Paul, Wrong. They were paid for in hard cash. As India is claiming having shot down PAF's F-16 where's the evidence? Showing a part of generic missile which can be used by most fighter jets does not constitute as evidence. So it seems there are no 'remains' of the F-16 as proof and has simply 'evaporated' all in smoke? ALL F-16 have built in trackers that US uses to monitor, US can switch them of by pressing a button. This is the reason why Pakistan is not using F-16 for strategic missions. Even there are seals present on the components and US official is present in Pakistan at all times to ensure the F-16 are not opened without his presence. @Faraz, it is not sold. But donated to pak for use only against terrorists with this clause. @Salman-C, Appeasing the people of Pakistan has ensured even more firmly Modi and his party's re-election in the forthcoming elections. India didn't like the stick with which the flogging happened. However, whether that be a long or short, wide or thin but accept the beating. They only want the choice of their stick. That's the issue. F-16 is obsolete. F-16 is not relevant anymore. @Ahmed, cash from US aid? @Akil Akhtar, True. Both, Pak and India have felt the same. Gifted? Where do you guys get these ideas from? According to US govt documents, Pakistan has paid $5.4 Billion from 2001 - 2004 for the purchase of F-16s. Then for the latest batch of F-16 Block 52 we paid $699 million which included payment to upgrade old F16s. @Justin Pandian, Was it given for use in defense or only for keeping and showing? When a country is attacked, they have the full right to defend with the suitable weapons. @Akil Akhtar, you cam to know that now? @Justin Pandian, Pakistan paid for these F16s. These 40 planes were held up by US and were not delivered as agreed and delivery was delayed for a few years. Do Pakistan spend billions of dollar to place the F16 in show case? We want to use them against enemy. @Faraz, Of course it is. They gave the F-16's on certain conditions. Pak. accepted those conditions. If the jets are being used for a different purpose, it is their business. And, Mr. Faraz, these aren't CARS. India Israel America nexus of terrorists.